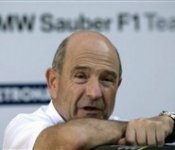 The Peter Sauber owned team will not be changing it's name any time soon despite BMW not being involved anymore. The team has entered the 2010 season under the official name of BMW Sauber F1 Team, and will continue to do so until the necessary paperwork is filed and special permission is given by the teams, FIA, and the Formula One Management group. A BMW Sauber spokesperson told 'autosport', "The team is currently called the BMW Sauber F1 Team, and this is the name which we stated in the entry form for the 2010 championship. At this point in time there is no firm date as to when we will submit an application for a name-change."